Thin Line Capital has made its first investment under its new structure. I've been sharing my thesis with many people now ("we are in a 2nd wave of cleantech investing, one that supports high-growth low-capex opportunities") and I continue to attract investors willing to back me, as well as discover tremendously exciting new companies. Sistine Solar is one of those companies. I'm struck by the passion and success of the founder/CEO, Senthil Balasubramanian, and the rest of the team. They are a group from MIT and they are working to unlock a whole new section of the market interested in aesthetics - a market segment awakened by Tesla's promises of a solar roof. Sistine is looking to serve that need with their novel SolarSkin technology, allowing the solar panels to blend visually into the roof. Check them out here at Sistine Solar. And, to accompany this, here's the January edition of my newsletter. This month I’m focusing on the changing solar market. The solar industry is split into three major segments – utility-scale, commercial and industrial (C&I) and residential. Utility-scale installations account for about 50% of the US market. They are the largest (>5 MW), consuming the most amount of land, ground mounted, and usually with at least one-axis, or two-axis tracking. C&I installations are the second largest in size (~500kW average), and represent 25% of the market. A typical C&I installation would be on a flat roofed building, like a warehouse, factory, or retail center. The smallest installations (around 5kW) form the last 25% of the market. These are the residential installations, mostly located on single-family homes and mounted directly to the pitch of the roof. 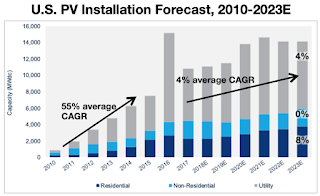 4%/yr and residential installations seeing a CAGR of 8% (from 2017 to 2023). The reasons are varied, but the ability of the grid to manage the variability of the solar resource, and the necessary adoption of storage are providing regulatory headwinds. 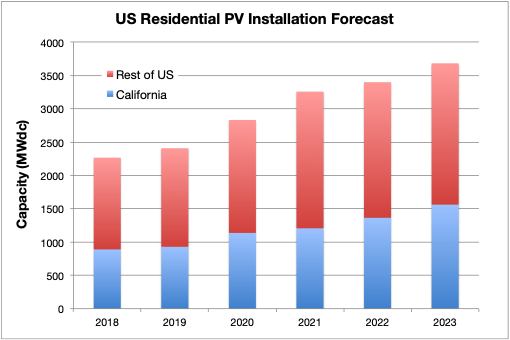 And yet, residential solar installations are still only between 1-2% of US homes. Utility-scale solar has dominated the market for the past several years. As the costs of solar equipment have collapsed, utility-scale solar has been the sector best positioned to take advantage of this. With its smaller batch sizes, and greater labor content, the “soft-costs” of solar dominate in residential installations. A typical residential installation might cost $3/W installed, whereas a utility-scale installation is under $1/W. 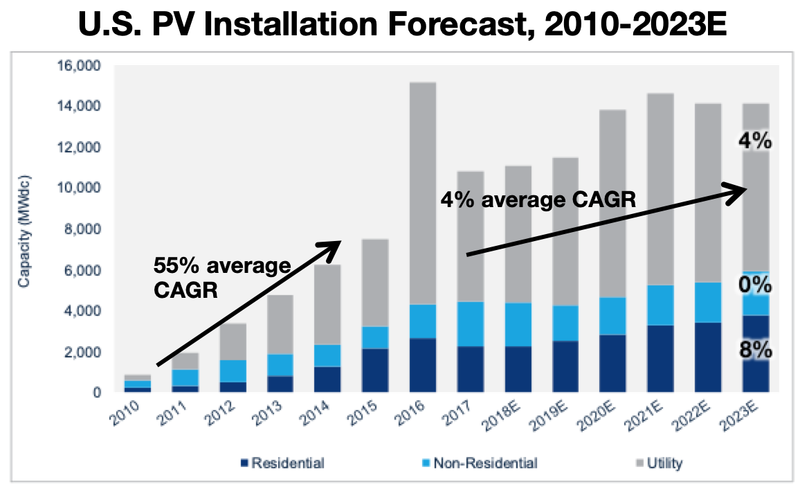 Going forward, however, we see that the growth rate of residential solar is twice that of utility-scale solar. That is where investment is most attractive. This will focus the attention of the industry on exploiting more the residential market, with less focus on growth in the utility market. (assuming costs fall from today’s $3/W) that results in a $9.2B spend on solar hardware and installations in 2023. Part of this growth is due to a market opportunity currently unique to California. In May 2018, the five commissioners of the California Energy Commission voted unanimously to require that nearly all new homes in the state be built with solar panels. The effect of this is that, starting in 2020, there will be an additional 200 MW/yr due to new construction. 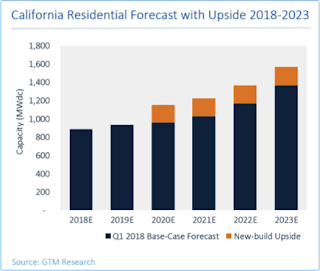 There are two takeaways from this – 1) the new home opportunity will add an additional $500M of spend to the market, and 2) due to the size of California’s market, this only adds about 12% to the already large market, which speaks both about the value of California policy, and the robustness of the market in absence of policy. Thin Line Capital’s investment thesis is to pursue low-capex opportunities that target the growth of large markets created by the changing energy landscape. We are now investigating a company that has an exciting proposition which matches this thesis. The first observation is that future growth warrants a focus on growth in the residential sector (over utility and C&I). The second observation is that, as growth slows, installers and module manufactures will be looking to compete on an axis of differentiation other than the two historic measures of cost and performance. TLC has identified an MIT spinout that has a very low-cost film that can be applied to any solar panel surface, allowing the solar panel to appear to be any image desired, allowing the solar panels to blend into the surrounding roof aesthetic, while only adding a small amount to the system price. This maintains the home’s curb appeal while allowing the homeowner to participate in the benefits of solar ownership. Because their IP revolves around proprietary printing processes and image design, this company can participate in this identified $9.2B annual spend without anywhere near the capital intensity of other companies in the value chain (such as module, inverter or racking manufacturers). The company has a track record of satisfied customers in six states (MA, CA, SC, NY, TX, and NJ), a backlog of installers looking to adopt their product, and partnerships with construction material partners. They are well positioned to serve the growth in these markets (including the new home-build opportunities in California in 2020). Solar Power and Photovoltaics Projects: A Technology and Market Overview”, NREL Technical Report NREL/TP-6A20-51137, April 2012. 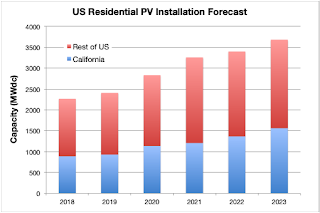 US Solar Market Insight, Q4 2018, Wood Mackenzie Power & Renewables, December, 2018. “Why The U.S. Residential Solar Market Has Slowed Down”, Forbes, June 2, 2017.